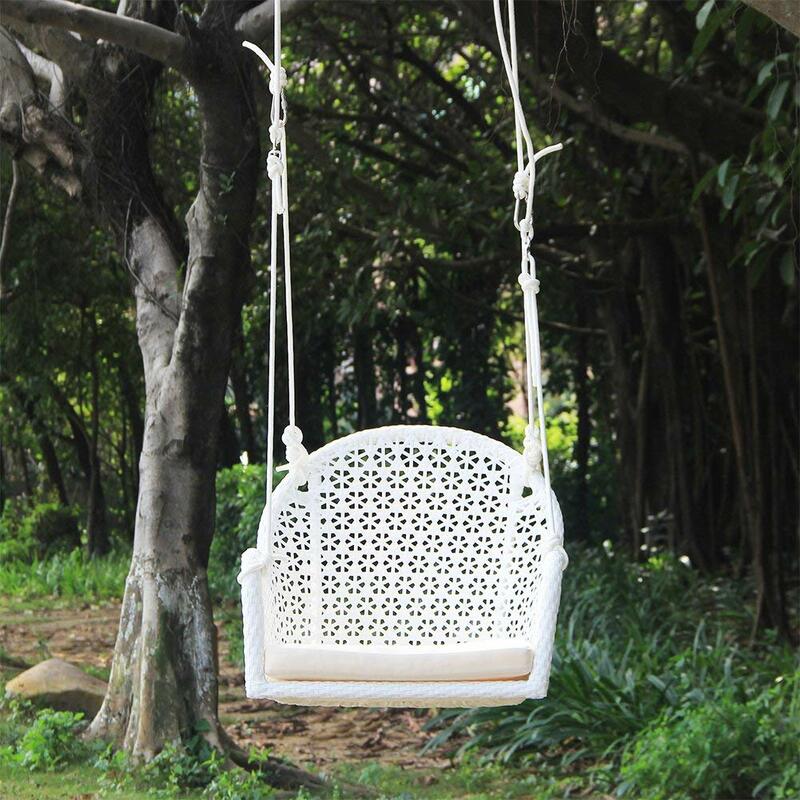 When it comes to outdoor swings, nothing beats the beauty and charm of a white wicker chair. The wicker gives a vintage feel while white allows it to blend in with any outdoor theme or setup. In terms of functionality, the woven wicker design also offers the benefits of comfort, flexibility and aeration. There are many different white wicker hanging chairs out there in terms of design and features. Here is a comparative of 7 of the best of these and what makes each one of them special. This model has a lounge chair design. It is therefore ideal if you want a porch or patio swing you can fully stretch out on. It comes with a padded lime green cushion for comfort. That way you can rest on your swing for as long as you wish without getting numb. However, the cushion cover is not weatherproof. This means you need to invest in a swing cover to protect it mainly from precipitation. The hammock swing has a steady curved stand for guaranteed stability. It also gives you the freedom to set it up in locations without overhead support both indoors and outdoors. Finally, it has a one person capacity and can support a maximum of 275 pounds. 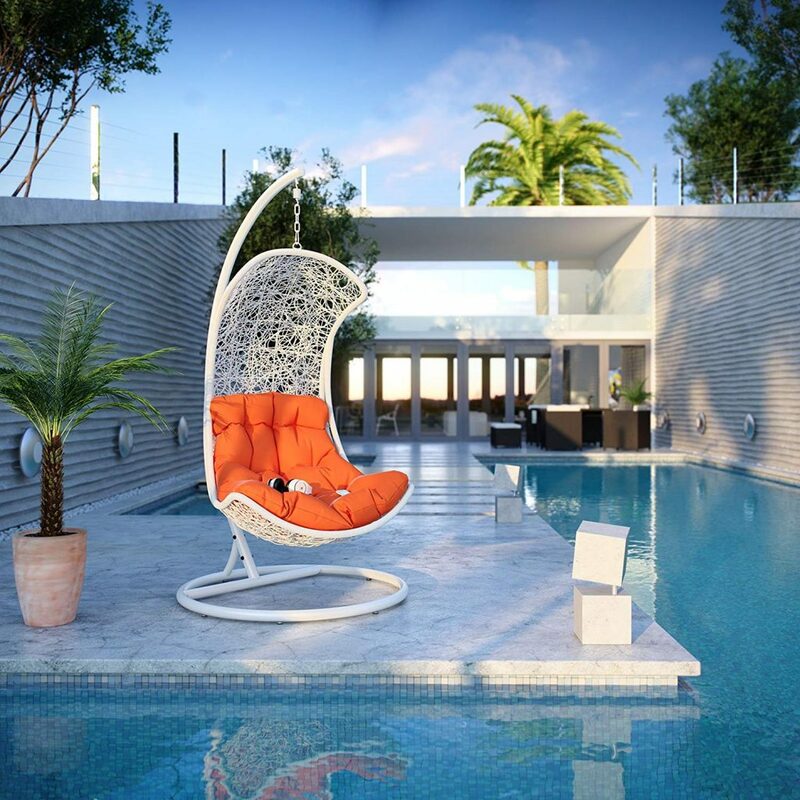 If you are looking for the lounge chair design this is definitely worth considering. It is perfect mostly for outdoor setup including on pool decks and rooftop balconies. However, it takes up a lot more space than most other swings on this list which makes it unsuitable if you have limited room. This one person 275 pound capacity swing has a sunken egg shape. The design is ideal if you are looking for a swing that offers privacy. 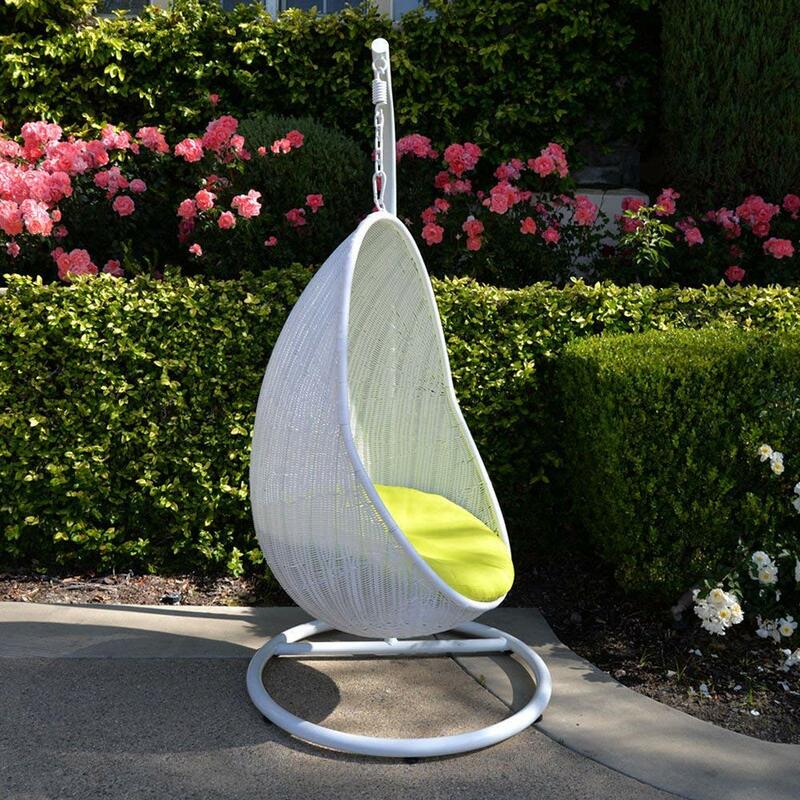 The egg shape combined with the neon yellow seat cushion provided also ensures that you are super comfortable while on the swing. Finally, this design offers a natural shade allowing comfortable use outdoors. You might, however, have to place it in such a way that the sun is behind you as the top part doesn’t offer full coverage. It is another white wicker seat on this list that comes with a stand set up. The base has a circular frame for increased stability. This is the seat you buy when you want a little escape nook. With the stand set up, you can put it either indoors and or outdoors for those moments you just want to escape and have some alone time. It also happens to be one of the cheapest of the 7 making it a great option when shopping on a tight budget. 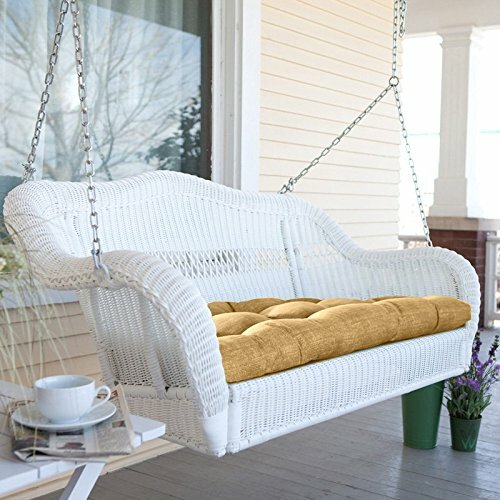 This swing is right off the bat one of the most aesthetically appealing white wicker swings. It has a slightly curved high backrest and a sunken seat base. 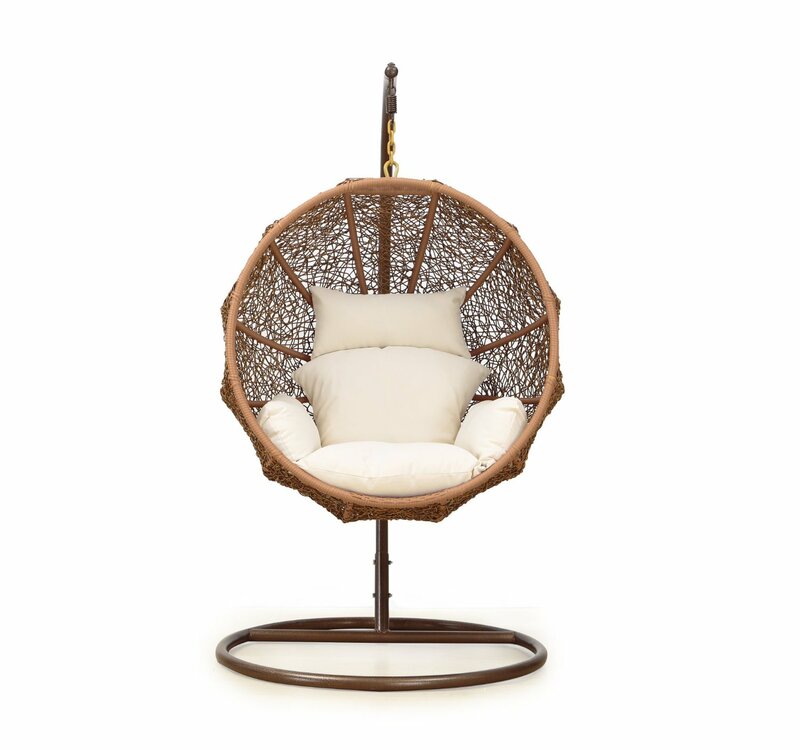 It also features woven wicker arm rests and is made from natural rattan. All these contribute to the optics making it a home décor masterpiece. It comes with a white seat cushion for added comfort. The cover on this cushion is removable for easy maintenance. 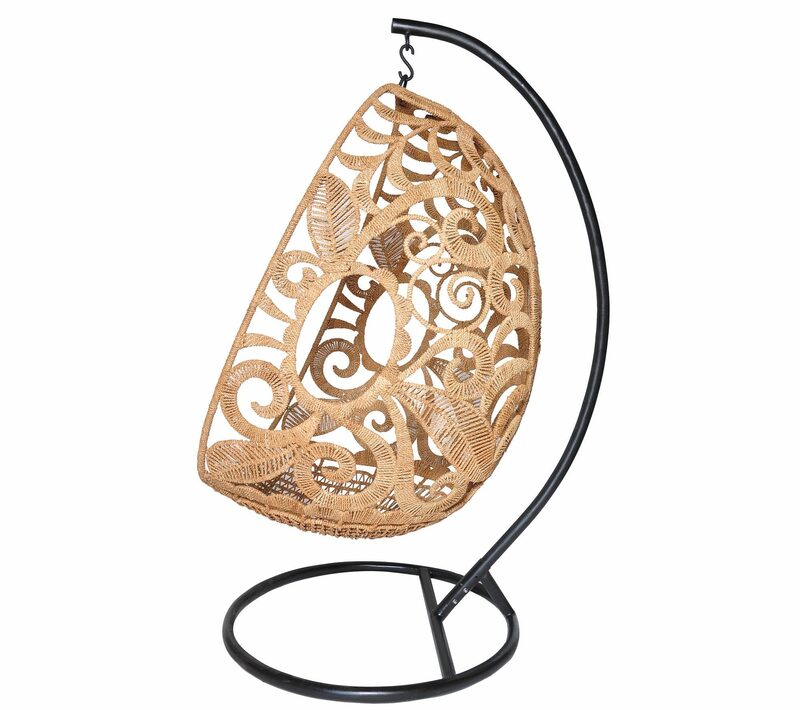 The swing has a suspension design and comes with strong hemp ropes. In this case, you need to find the right place to set up with overhead support. The challenge here is finding a room in the house with ceiling structures that are strong enough to support the swing and the user. If you are looking for an aesthetic masterpiece for your indoor spaces, then this is the seat for you. The main con is the fact that it is not suitable for outdoor use so if this is what you want then keep looking. The setup is also a little challenging and is best left to professionals. Here you can find the best hanging kit. This is another great option if aesthetic appeal is a major priority for you. It has a wide egg shape with wide woven wicker all around. It also comes with a large seat cushion that covers the base and most of the back and sides. 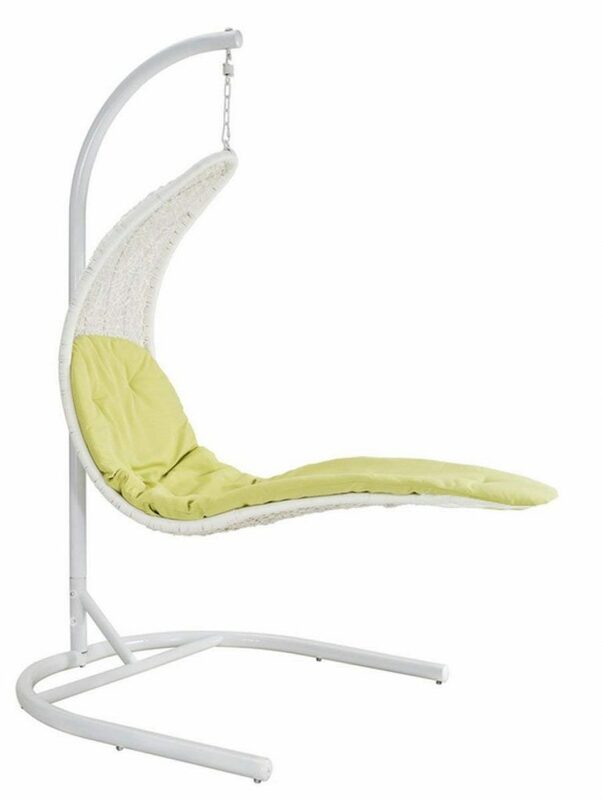 This sets it apart in terms of comfort from the other swings on this list with only base cushions. The seat is designed for both outdoor and indoor use. It features weather resistance reinforcement including powder-coated steel frames and waterproof cushion covers. Finally, it has a stand design which makes it easier to set up and safer than the suspension swings. The great aesthetics, sturdy design and comfort features make this one of the overall best options on the list. However, it also happens to be the most expensive model here. You, therefore, need to be willing to let go of a few extra tens of dollars to enjoy its features. It seems that every inch of this swing is designed for outdoor use. It features resin woven wicker which is resistant to both water and UV. It also prevents fading of the frame and the wicker despite being outdoors all the time. The removable seat cushion is also resistant to these harsh elements of weather. 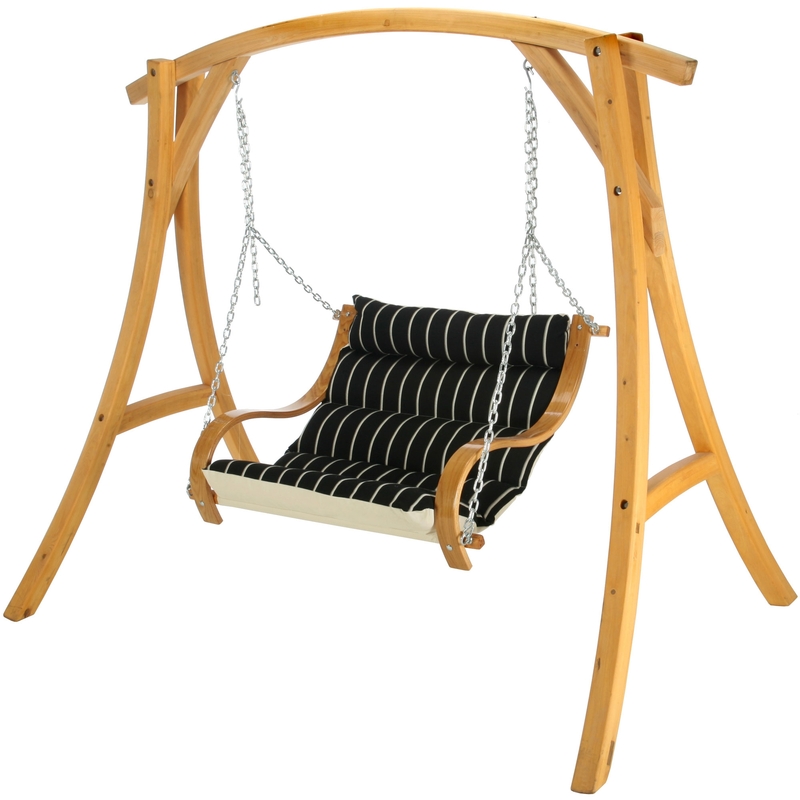 It has a suspension swing design and comes with strong woven fabric cords. If you do not have a strong ceiling over your patio or trees in the yard you will not be able to set it up. Unless, of course, you are willing to bear the extra cost of having to buy a separate frame. The swing is stronger than most others on the list in that it can accommodate up to 350 pounds. The seat portion is designed for one but can comfortably accommodate two children. Finally, it comes with an aluminum frame which makes it durable and strong but at the same time very light. Here you can read our review of this model. 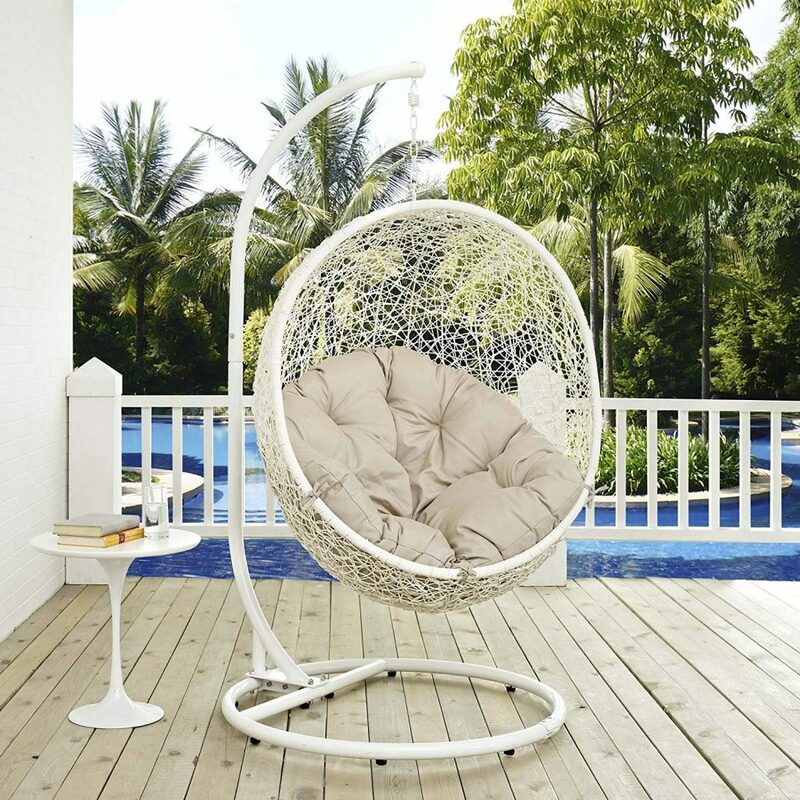 This swing is ideal for full-time outdoor use. It is also a great option if it needs to be shared especially by children. Finally, as the cheapest option on our list, it is worth considering if you don’t want to spend too much on this investment. In terms of aesthetics, this swing set looks a lot like the KOUBOO model reviewed. It has the same long backrest and sunken seat base. One key difference is that the Modway has a stand design making it easy to set up pretty much anywhere. It also has a thicker and larger cushion ensuring that it is a lot more comfortable. The seat is outdoor-friendly with weather resistant resin wicker, cushion covers and stainless steel frames. Finally, it can only accommodate one person with a weight limit of 265 pounds. There is nothing especially outstanding about this seat. It does, however, combine the best of most models on this list including comfort, aesthetics and ease of setup. So if you want all these from one model then consider this option. This large bench swing can sit up to 3 people comfortably. It comes with a removable base cushion for comfort. The arm rest and straight back also contribute to comfort on the swing. It has a suspension design which though stable is difficult to set up. However, the stainless steel chains used to suspend are strong and durable. This ensures that the swing remains strong and steady for a very long time. What is easily the most important feature with this swing is the high number of people it can accommodate. Consider choosing it if you want something you and your family can enjoy outdoors at the same time. 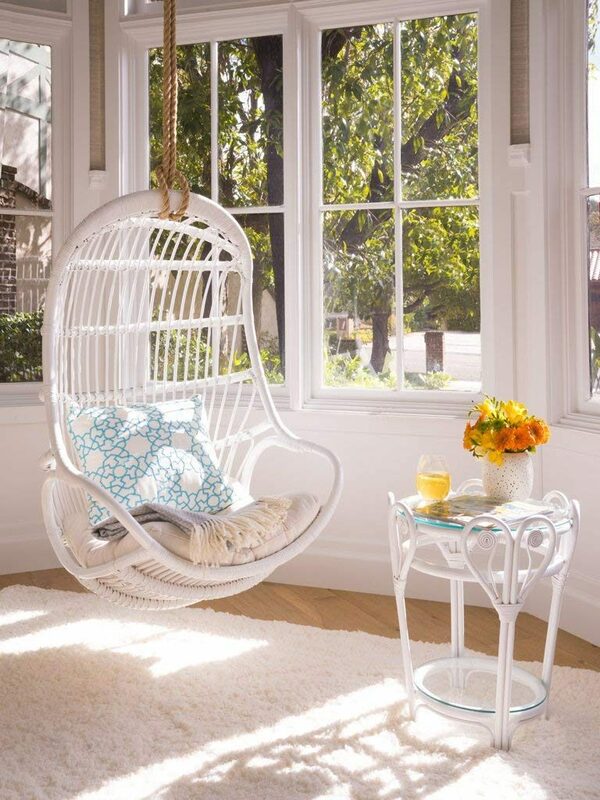 These are the 7 most beautiful white wicker swing chairs available on the market. No matter which you choose, you’re making the right choice and the whole family will love it.